Along with the Japanese structures, in book making class this summer we also explored some western methods. This is a case bound sketchbook. Follow the picture above for a few more angles. The book block in this structure consists of a number of signatures or gatherings of pages folded in half, in this case 11 of them containing 2 sheets each. It's hard to find sketchbooks with thick velvety paper so I decided to go all out on this one and use a grey Rives BFK, a cotton based print making paper that feels more like cloth than paper. The gatherings are stacked, and then sewn onto tapes—ribbon like stripes of linen which give the book its structure. This design allows the book to be strong, even with a large number of pages, and still able to open flatly. 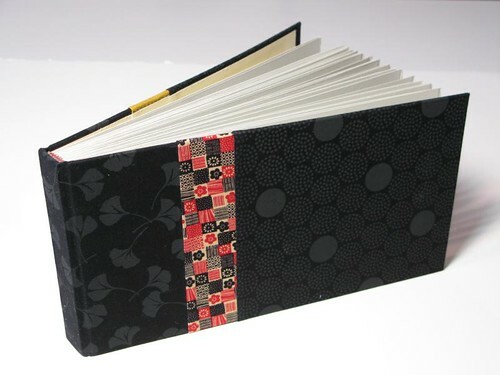 The term "case-bound" refers to the cover, which is constructed from thick chipboard, here covered with backed fabric. I found these great prints in a local quilting supply store. The front side has a bright strip, this red flower pattern, while the back has some colorful stripes. I also had the chance to hand sew the headbands for this book. Headbands are those little stripped bits of embroidery at the head and foot of the spine, just inside the cover. In the past they added strength to what is an often manhandled part of the book, but today they are often simply decorative items. Usually they are machine sewn onto tapes and pasted in, but these headbands are hand stitched and extend down into the sewing stations on the spine.